For the record, 2016 was a warm one across the Midwest. Whether you subscribe to Climate Change or Global Warming, we broke a few records and continue to do so. Besides a healthy amount of SPF70 sunscreen in the boat, there were a couple key items that made my days on the river more comfortable and enjoyable. I would like to share my experience with you from the past year so that you may prepare yourself for next summer, in case we see more sun filled days than the previous decade. 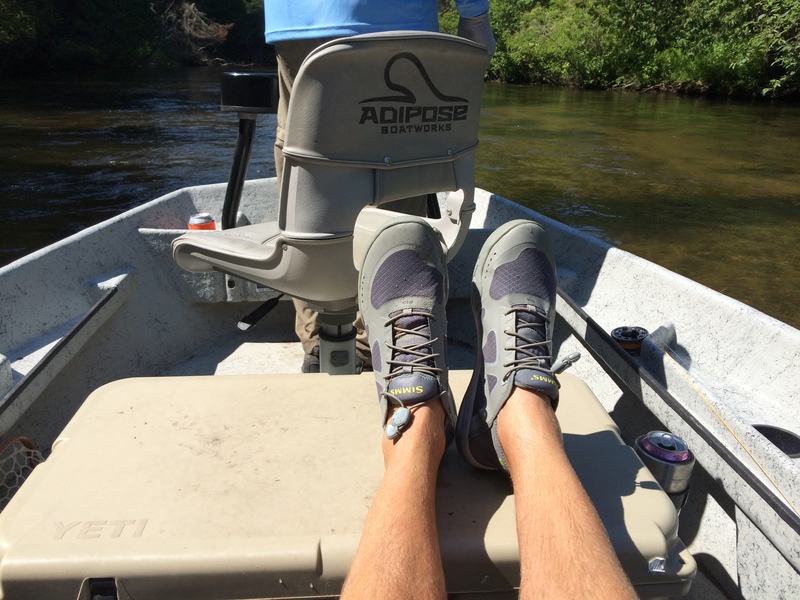 Simms Current Wading Shoe- can’t imagine a day on the river without them. The Simms Current Shoe has surpassed its reputation for being an all day long comfort shoe, whether on the boat or on shore. The Right Angle Technology footbed provides the angler with a definite lack of fatigue in the lower leg muscles after standing and casting from the bow of a drift boat in Montana or poling platform in the Keys. 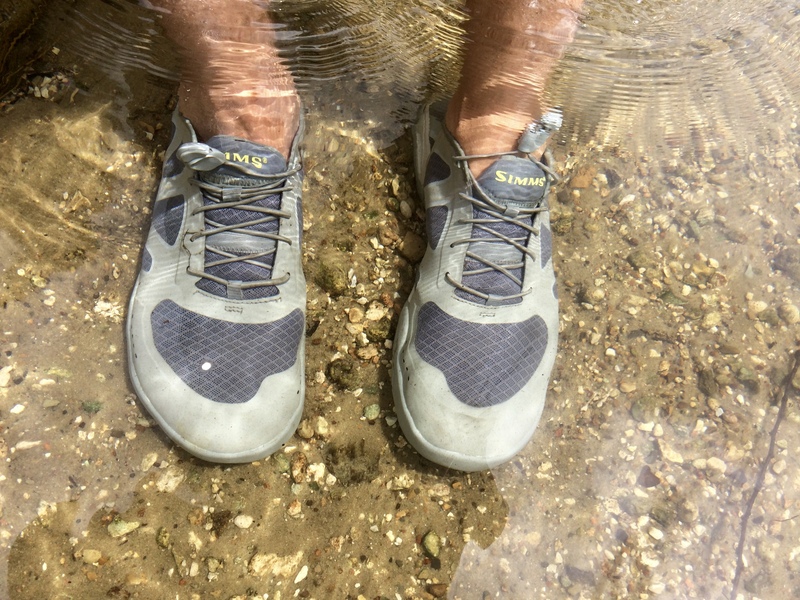 I have waded many cold water feeder creeks and found the quick dry mesh and smooth uppers were very comfortable and prevented any sand load from depositing in my shoe. These are fast becoming my favorite shoe at the beach and on the power boat, keeping a snug fit from the bungee lacing and preventing the tops of my feet from getting scorched from the high midsummer sun. My original interest for purchasing these began with a search for a good wading shoe for SUP fishing. When I came across the Current shoe, it made total sense. Perfect for canoe, kayak and SUP advocates, they stay on your feet, and are comfortable, while protecting your feet from jagged rocks or cedar branches. For years I have been an advocate for Keens, still appreciate the slip on comfort of a good trail sandal, but the deck specific design of the Current Shoe is hard to be overlooked. A couple of clients had purchased the Current shoe and we have had similar experiences pertaining to all day long comfort and appreciation of design. There were three colors available last season, black, chartreuse and blue, Simms may have a few new ones lined up for 2017. They have branched out and tapped into the casual shore shoe market with the RipRap Sandal, Westshore Boat shoe and the Challenger Boat shoe, with many leather upgrades for the lasting comfort that can take you late into the evening and far away from the rivers edge. I have yet to test them out, but have given them a close eye at the Midwest Expo. Perfect idea for your Holiday shopping list, they are a priced at close to cool C-note, they will last you more than one season if treated with some care. Two other items from this past season I could not imagine a day without, the Simms Surf Short and SolarFlex Crewneck, with SPF70 and quick dry technology, I never had a moment concerned with overexposure to the daily beat from solar rays. My only drawback on the SolarFlex is the staining from perspiration or from a recently wetted Buff around the collar. The water stains seem to be semi-permanent, but these are the least of my concerns when the alternate is melanoma. Last year, I was interested in the BUGSTOPPER Hoody from Simms. Seemed it was only available in women’s options. I inquired from our Midwest Rep’s at the EXPO, Kim-Tony Ferrie and was pleasantly surprised to see a mens Hoody for the next season. I had to purchase, and will follow up later this season on how well it works in the skeeter infested cedar swamps of northern Michigan. Simms has been busy twerking waders, boots, jackets with latest from Gore-Tex and coming out with a few really cool T-shirts- “Rain Delays are for Baseball” very cool. Check out the entire line up or SIMMS HOLIDAY Gift Guide to get a new hat to stuff someone’s Christmas stocking. Simms has been amping up the rod/reel storage and travel luggage in the passed few years. They have also been making some notable improvements in their vest & hip packs in recent years. 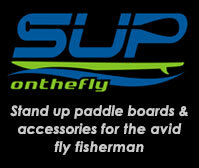 I hope you have a chance to check them out at a local Fly Shop and remember to Shop Local. Have a safe and Happy Holiday!! !